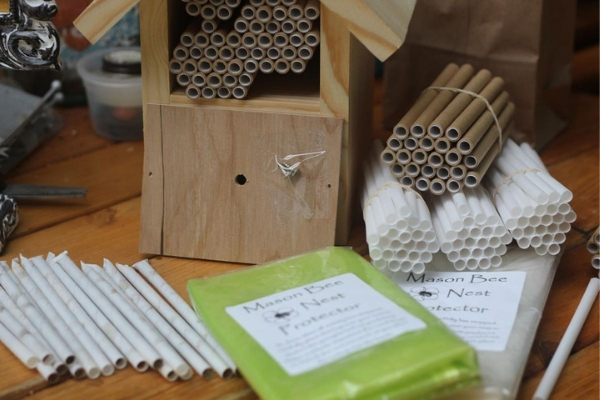 You can release your mason bees anytime from February until May. You can delay their dormancy by placing them in a cool environment below 55 degrees, but do not hold them past May because they may starve and die. Place your mason bee nest on an east or south east facing wall under the eaves of your house or shed. Fill your nest with new nesting material (tubes and liners). Next, place your dormant bees that you had cleaned and stored over winter on top of the nesting material or If you purchased one of our mason bee houses, place the cocoons in the lower hatching box area and secure the faceplate. In a few weeks you will start to see some activity. The males will emerge first and will be very lethargic. These new little guys are just stretching their wings and ready to start pollinating! A couple of days after the males emerge, you will see a lot more activity when the females emerge. These are much larger than the males (about twice in size). Mating will occur and also lots of pollination. Be sure to put a pot of mud near the nest. This will help the bees when constructing the cell walls between each egg chamber. Now, you just need to sit back and enjoy your little bees. They will pollinate up to 100 yards away and several times more than honey bees! 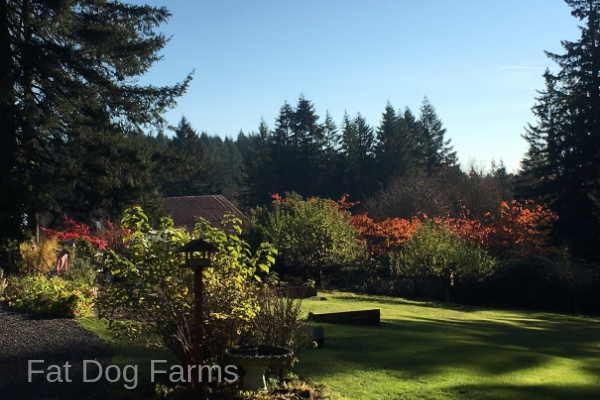 Fat Dog Farms was recently featured in The Chronicle Newspaper. To read what the buzz is all about, follow this link: Tubed bees: Local woman sells mason bees to home gardeners. 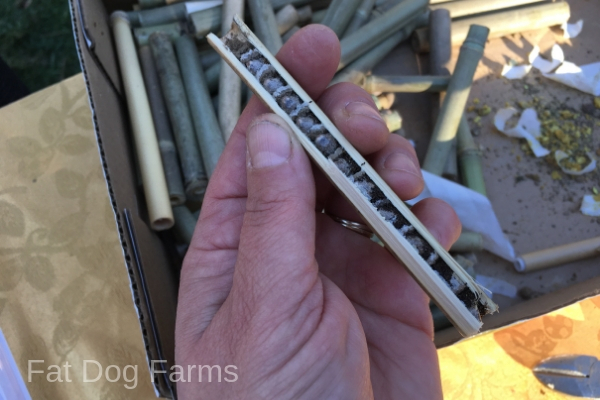 Anytime from October to January is a great time to harvest your mason bees and get them ready for spring. We will walk you through the process of “cleaning” your bees. If you want to make sure your colony has a viable chance, then you should take time for this simple process. First, carefully separate the white nesting tubes from the brown guard tubes and make a pile of each. You will reuse the guard tubes each year, but dispose of the white nesting tubes after you unwrap them. Carefully, unwrap each white nesting tube. You will want to do this over a table cloth or newspaper. Inside each tube you will discover 6-8 cocoons (and sometimes other fun creatures! ), separated by a mud wall. Separate the cocoons. When you have removed all of the cocoons, place them in a bowl and fill with cool water. Don’t let them sit too long! Gently swish them around to remove debris and any possible mites (fluffy yellow looking debris). Mud and other contaminants will sink in the bowl and the cocoons will float. In a small colander, gently rinse the cocoons and spread them out on newspaper to dry. After an hour or so, move them to a cool location to continue to dry. A shed, garage, or basement is ideal. Remember, don’t keep them inside a warm house too long (5 hours max)—they may hatch! After the cocoons have dried you can now place them into a paper bag and store them until February or March in a cool shed, garage, or basement that is unheated. By following this process, you should be able to significantly increase your mason bee population. Now is the time to protect your pollinators from the winds and rain of fall. You will want to remove your nest (or just the tubes), carefully! They need to be brought into an unheated storage room, garage, or shed that is cool. By removing your nest or tubes, you will protect the larvae from being eaten by predatory wasps and birds and also protecting from the storms and freezing temperatures that are coming in the next few months. 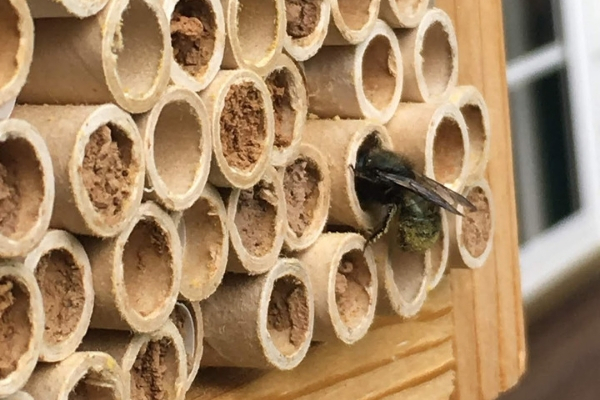 How are your mason bees doing this summer? 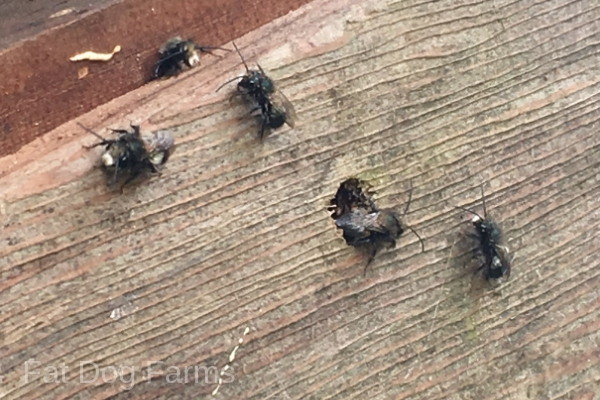 The mason bees that emerged earlier in spring should now be all gone. 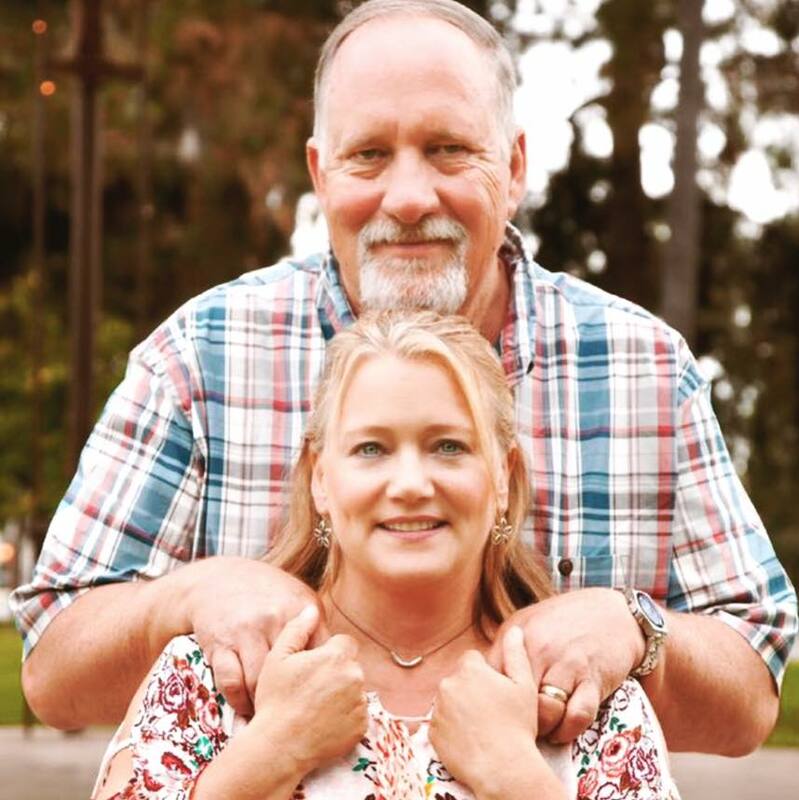 They spent their short life pollinating and producing offspring for next year. Now your newly filled tubes are filled with larvae that have started to develop inside the tubes. They will soon make cocoons and become new adults resting in the cells. Now is the time to protect your pollinators. In June, when all activity has stopped, carefully place a thin mesh bag over your nest to protect the young larva from predatory wasps and birds. Important: Be careful not to disturb the nest too much as you place the netting over the house. With the onset of fall, the bees will become dormant as they go into hibernation. Now you just sit back and wait until fall when you will need to remove the nest for winter storage.